The smallsat manufacturing and components market has developed somewhat haphazardly – a combination of post-university projects, commercial start-ups, and established companies growing into the smallsat business – producing a multitude of players in an increasingly competitive market. Mergers and Acquisitions (M&A) is the natural consequence for this young market as it matures and companies seek to consolidate market share. Recent deals provide an understanding of what players are hoping to accomplish by aligning their interests, and what this might mean for the smallsat industry at large. In December 2017, ÅAC Microtec acquired Clyde Space in a deal that will see Clyde Space owners take a 49 percent stake in the new entity. This end of year deal, coming mere months after Clyde CEO Craig Clark noted efforts to raise additional funding for expansion that included an openness to acquisition, unites two subsystem and end-to-end manufacturers. The combined company has a broader portfolio and enhanced ability to pursue new opportunities, building on their mutual experience, resources, and distribution networks. General Atomics acquired the U.S. assets of Surrey Satellite Technology in November 2017, following the latter’s decision to close its U.S. subsidiary. With only limited cubesat experience, this move provided GA with a means into the broader smallsat manufacturing market without investing the time and effort to build capabilities from the ground up. GA will be able to leverage the SST-US facility and trained personnel alongside its own strong position as an incumbent defense contractor to compete for ~1-500 kg projects. Late 2016 saw end-to-end manufacturer GomSpace acquire NanoSpace, a propulsion subsystem provider. This step towards vertical integration controls costs and brings an increasingly sought-after capability under GomSpace’s control, providing a competitive edge not only in general demand, but particularly for upcoming constellation RFPs likely to require advanced maneuvering capabilities. While more partnerships than formal M&A, the mid-2017 agreements between Lockheed Martin and Terran Orbital and The Space Alliance (Thales Alenia Space/Telespazio) and Spaceflight Industries highlight the growing interest of traditional prime manufacturers in the smallsat sector. Both plays enable established primes to expand their know-how in the budding smallsat market without requiring significant internal R&D, while allowing the younger partners to benefit from their deep pockets and expertise. Such arrangements also open opportunities for cross-marketing and unique proposals that leverage the niche skills of each partner. While instances of such M&A and partnership activity are limited considering the vast number of component and platform manufacturers active in the smallsat industry, its importance within the lens of expanding demand for smallsats is meaningful. 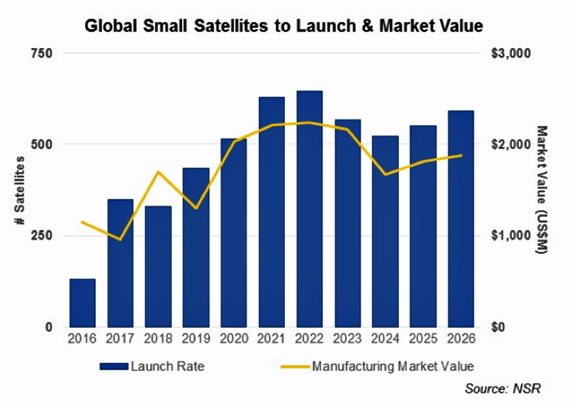 NSR’s Small Satellite Markets, 4th Edition, found the annual launch rate will approach 600 satellites by 2026, a more than four-fold increase over 2016. This level of activity will generate a total $17 billion in manufacturing revenue. As the market will progress towards fewer, bigger contracts alongside consolidation within the operator space, each win is high stakes for manufacturers. The smallsat manufacturing market is in the early stages of what will be an increasingly active M&A period as competition heightens. The consolidated manufacturing landscape that results should be beneficial to smallsat operators, as each combined entity will have a broader portfolio of solutions and the enhanced engineering team to solve complex requirements. In this environment smallsat manufacturers and component providers must be aggressive in securing market share — or otherwise leave themselves open to acquisition, or being squeezed out of the market altogether. Report authored by Carolyn Belle, Senior Analyst, NSR USA.